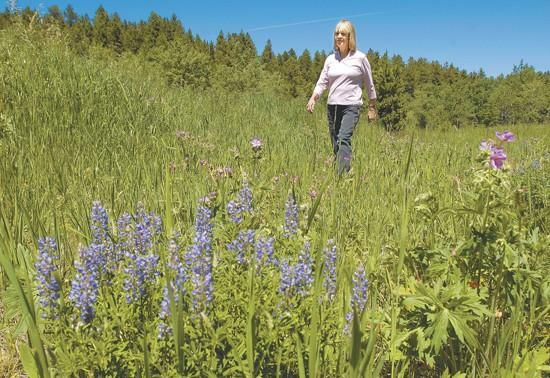 Ten years after the disappearance of Amy Wroe Bechtel, Amy's mother, JoAnne Wroe, spends a lot of time walking among the wildflowers near her home west of Red Lodge. A family photo of Amy is shown at top. What happened to the 24-year-old woman remains a mystery. An intensive 10-day search-and-rescue operation turned up few clues beyond her white Toyota. Amy Wroe Bechtel and her husband, Steve Bechtel. In a meadow behind a sturdy log house above Red Lodge, JoAnne Wroe has found a place to feel connected with her lost daughter. Without a grave to visit, it is here among the flowers and trees and a meandering mountain creek that Wroe feels closest to Amy. "When I go out and enjoy, I think Amy is watching me," Wroe said. "Where I'm living now, that's what this does for me. I go out and I look at the flowers because …"
Wroe's voice trails off as she tries to describe how it is possible that a place, even a beautiful place such as this, could begin to fill the emptiness in her heart. "I'm doing it because Amy would have liked it," she said. Amy would have liked this place among the aspen trees, wildflowers and songbirds, JoAnne Wroe explains. And Amy would be happy to know that her mother has found some solace in the mountains. 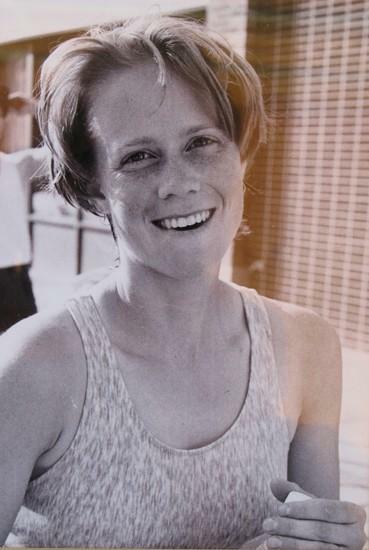 On July 24, 1997, Amy Wroe Bechtel disappeared in the mountains outside Lander, Wyo. At least, that's where her car was found. What happened to the 24-year-old woman remains a mystery. An intensive 10-day search-and-rescue operation turned up few clues beyond her white Toyota, which was parked on the side of a two-lane road in the Shoshone National Forest. Evidence remained elusive when the search for Amy evolved into a criminal investigation. year converted it into two college scholarship funds in Amy's name. Fremont County Sheriff Sgt. Roger Rizor has been the lead investigator since shortly after Amy disappeared. She is still officially listed as a missing person, Rizor said. believe what happened to her happened on the day she disappeared," Rizor said. The detective won't describe anyone as a suspect, choosing instead to use the words "a person of interest." "In my mind there is only one person that I want to talk to, only one person who has refused to talk to law enforcement, and that's her husband," Rizor said. Steve and Amy Bechtel were married for 13 months before she disappeared. They met at the University of Wyoming in Laramie and moved together to Lander to pursue their passion for outdoor activities: She was a runner, he a rock climber. Steve Bechtel met with investigators only once, shortly after Amy disappeared. He then got a lawyer and has refused to provide further statements. He did not respond to a recent request by The Billings Gazette for an interview. Steve Bechtel left Lander for Utah after Amy disappeared. Three years ago, he had Amy declared deceased, JoAnne Wroe said. He has since remarried and moved back to Lander, where he owns a fitness center. His decadelong silence has only intensified speculation that he knows what happened to Amy. "If a man's wife disappears mysteriously, you don't clam up, you don't refuse to cooperate with the cops," Rizor said. Joanne Wroe is equally suspicious of her former son-in-law. About a year after Amy went missing, Steve Bechtel met with JoAnne and her husband, but he was evasive and provided few answers to their questions, she said. "We still don't know anything about where she is and what's become of her," JoAnne Wroe said. "And we have concerns that after all these years Amy's husband has still not agreed to work with law enforcement and answer questions. We are still waiting for Steve to come forward so that he can be cleared. It's the only way he can clear himself from being a person of interest." After Joanne Wroe's husband died in January 2000, she built the log house in the mountains near Red Lodge, on property the couple bought as an investment years before. It was finished three years ago. If Amy were there, JoAnne Wroe and her other three children would be celebrating Amy's 35th birthday on Aug. 4. Wroe will be in California attending her niece's wedding on the 10-year anniversary of Amy's disappearance. At 65, she continues to work - as a part-time teacher in Powell, where she moved from when the cabin was done, and at a wildlife rescue center in Red Lodge. As the years have passed, Wroe stopped marking the anniversaries since Amy was last seen alive. "I want to just get through it and past it," she said. Five years ago, Wroe made the three-hour drive from Powell to Lander, searching for something that could bring her answers. "I wanted to put up yellow ribbons again," she said. "I just had this thing, that somebody there in Lander knows something." She started visiting stores, asking the owners to consider putting up her daughter's posters again. One store owner complained: "Haven't we let this rest yet?" "He didn't know I was her mother," Wroe said. "It hit me hard. It wasn't his fault. But it suddenly made me realize how other people feel. I decided then that I didn't want to do anything special after that." Her other children - Amy was the youngest of four - deal with Amy's disappearance in their own way, JoAnne said. Some of the ways they cope are clearly visible to their mother, such as her oldest daughter's protective nature toward her two children. Other signs are more subtle and private. "It hurts me to see my kids hurt," she said. "Their lives are so affected. Even my grandson, who is a freshman in college, is very protective of his mother. It has affected all of us." It is hard for Wroe to accept that her daughter might be a victim of crime. Amy, she said, was caring, kind and concerned, not only for those closest to her but also for the world she shared with everyone. Amy was adamant about recycling and "very conscientious about taking care of the Earth." Wroe said she was slow to react when investigators asked the family to provide Amy's dental records and any material that could supply them with some of her daughter's DNA. She collected a lock of Amy's hair saved in a baby book. "That was when things hit me," she said. "It was like, 'OK, this means they think she's dead.' There's just no way, because nobody would hurt Amy." Wroe is still reluctant to fully accept that Amy might be dead, although she knows that after 10 years there is little hope of another explanation. She is drawn to news accounts of other missing children. "Sometimes I can't watch," she said. "Other times I am really curious, hoping that it will give me ideas or answers on Amy's disappearance. "A part of me is realistic, and I'm aware that she is probably not alive," she said. "I have learned to live with the fact that Amy is gone. But I have not accepted it, and I will not until I know what happened." Contact Greg Tuttle at gtuttle@billingsgazette.com or 657-1320.